The mountainous landscape of the Witteberg Private Nature Reserve owes much of its rugged charm to the Palaeozoic sedimentary rocks – sandstones, siltstones and mudstones – of the Bokkeveld- and Witteberg Groups that underlie this area. These rocks were laid down during the Mid- to Late Devonian Period, some 380 to 355 million years ago. At that time Africa was united with the other southern continents, including South America, Antarctica, Australia and India, to form the enormous supercontinent Gondwana. By late Devonian times Gondwana was situated close to, or even over, the contemporary South Pole so climates were probably highly seasonal. There would have been 24 hours sunshine in midsummer and continuous night in midwinter, as in the present Arctic and Antarctic regions – and very different to the modern day Little Karoo! Nevertheless, this was a relatively warm period climatically for the Earth as a whole, probably due to the greenhouse effect of high carbon dioxide levels in the atmosphere. The Bokkeveld- and Witteberg sediments were laid down in cool shallow seas that flooded the margins of Gondwana in Devonian times. Sedimentary structures within the coarser-grained rocks of the Witteberg in particular indicate that episodic powerful storms at sea were the major agent of sediment transport and deposition. Various well-preserved sedimentary features such as symmetrical wave ripples, wavy cross-bedding and mudflake conglomerates support this interpretation. A cyclical pattern of deposition with rhythms of 100.000 years (probably of astronomical origin) to about 3 million years (controls uncertain) can be recognised in these rocks, reflecting cyclical changes in global sea levels which can be detected in Mid- to Late Devonian shallow marine sediments worldwide. 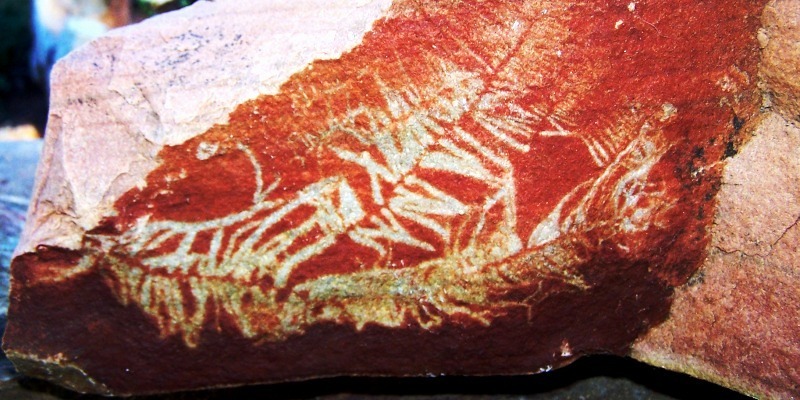 The Devonian Period, often referred to as the “Age of Fish”, was also the time interval when complex plant communities (including the first trees) and four-legged vertebrates (tetrapods) became established on land. At times there was very little oxygen in the seawater above the seabed, so marine faunas are often limited in variety. The predominant fossil groups represented in the upper Bokkeveld- and lower Witteberg Groups of South Africa include (a) brachiopods (lampshells) – bivalved marine invertebrates which were attached to the seabed by a horny stalk and fed by filtering small organic particles from seawater, as do the superficially similar (but completely unrelated) clams and mussels; (b) several groups of fish, mostly extinct, including brackish water sharks, acanthodians (“spiny sharks”), placoderms (armoured fish with bony plates for teeth), and rare lobe-finned fish distantly related to the living fossil coelacanths; (c) primitive land-living vascular plants such as lycopods (club mosses) which were washed offshore by floods, and (d) a variety of trace fossils, i.e. fossil burrows reflecting the activity of invertebrate animals living and feeding within the sediments of the sea bottom. All these fossil groups have been recorded, including brachiopods and the only known fish remains from the uppermost Bokkeveld Group (Karoopoort Formation) of South Africa. Excellent examples of the fascinating spiral trace fossil Spirophyton (= Zoophycos) occur all over the reserve. They are particularly well preserved in parts of the Witteberg Group where they may cover entire sandstone bedding planes. The correct interpretation of the feeding behaviour reflected by this complex trace fossil remains controversial. However, it is clear from the Witteberg and other examples that the animal involved – which is still unknown – transported organic-rich muddy sediment as pellets down from the seabed into its spiral burrow, deeply buried within the bottom sediments. The burrow has even described as a “beautiful cesspit”! One of several interesting hypotheses is that the Spirophyton / Zoophycos animal was actually gardening decomposer microbes (perhaps bacteria or fungi) on a compost of its own faecal pellets, rather as modern fungus gardening termites cultivate edible fungi on vegetable detritus which they have collected above ground. Please note that all fossils in South Africa are protected by law. Their collection or removal without an official permit is a punishable offence!